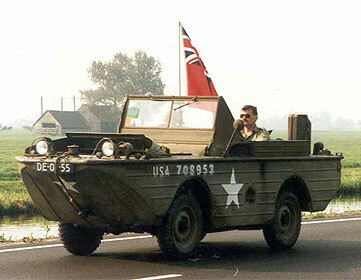 Amphibious Jeeps were a totally different animal. In 1941 the US National Defense Research Committee had begun plans on working on a quarter ton amphibian jeep dubbed the QMC-4 Truck Light Amphibian. Marmon Herrington was the engineer who took on this project with the assistance of several naval architects, Sparkman and Stephens Inc and the Ford Motor Company. Many of the initial tests were run at Stephens Institute in Hoboken, New Jersey. Work progressed quickly and by 1942 the US National Defense Research Committee showcased a fully functional amphibious jeep, not in New Jersey though, on the Huron River in Dearborn, Michigan. A number of decorated and high ranking army soldiers witnessed the demonstration and praised the amphibious jeep. Orders started to be taken. Between 1942 and 1943 Ford manufactured almost 13,000 amphibians, called the GPA. The ï¿½Aï¿½ stood for amphibious. The overall design was decent, but it had its problems of its own. This vehicle is also known as a seep, (sea jeep). It was capable of carrying five people, including a crew of two. It was truly an amazing vehicle and was know to travel at 10 knots in the water. Copyright (c) 2005-2016 [Jeep-History.com] All rights reserved. Not responsible for any discrepancies within web site.